This volume deals with the determination of the times of Muslim prayer and the direction towards the Kaaba in Mecca (Arabic qibla) in a little known astronomical tradition of the Islamic Middle Ages. It presents an edition, translation, and explanation of selected chapters from three of the most important folk astronomical treatises, written by al-Asbahi (Yemen, 13th c.), Ibn Rahiq (Hejaz, 11th c.), and al-Farisi (Yemen, 13th c.). The first part introduces the authors and their works and describes the relevant religious and astronomical background. 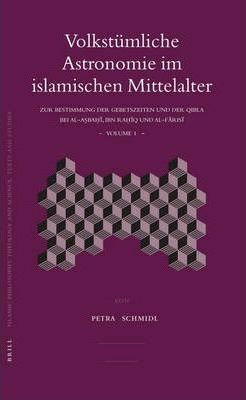 The second part comprises the edition of the selected - and now for the first time published - chapters of the three works and a German translation. The third part contains a lexicographical survey with basic astronomical, religious, and related information, and a commentary on each chapter. The fourth part gives an overview of the topics dicussed.